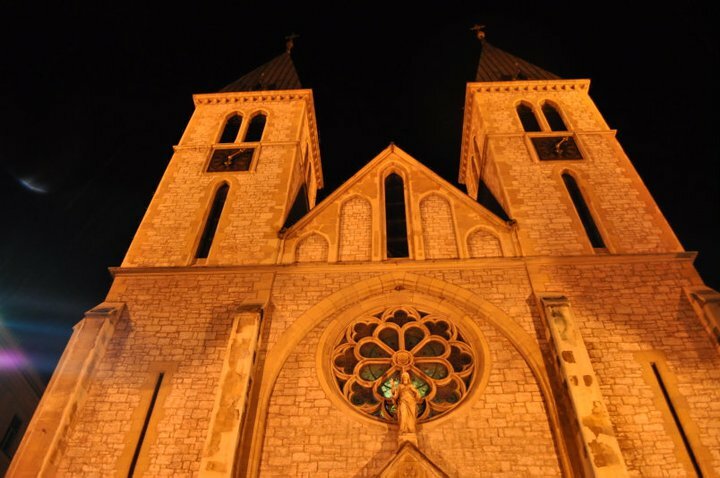 The city of Sarajevo sits in an area that has been inhabited since the Neolithic age, with a medieval settlement in the region large enough that a cathedral was established by the early 13th century. Sarajevo as it is known today is traditionally said to be established in 1461 under Ottoman rule. It is known as the Jerusalem of Europe in part for its location between east and west, and for its concentration of major religious houses of worship in such close proximity. Within less than a square kilometer one can find the Catholic and Orthodox cathedrals, the Emperor’s Mosque, and the Sephardic Synagogue, as well as other mosques and churches. We toured several during our first evening. On the second day of the conference, we took a bus tour through Herzegovina, visiting pilgrimage sites of each of the major religious groups. 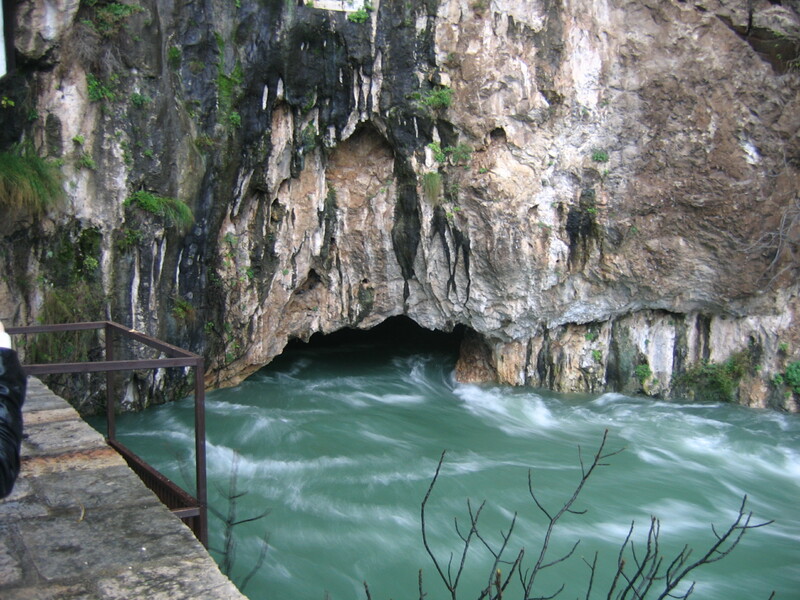 Our first stop was a Tekije (A Dervish house, like a monastery) in Blagaj, overhanging the source of the Buna River. 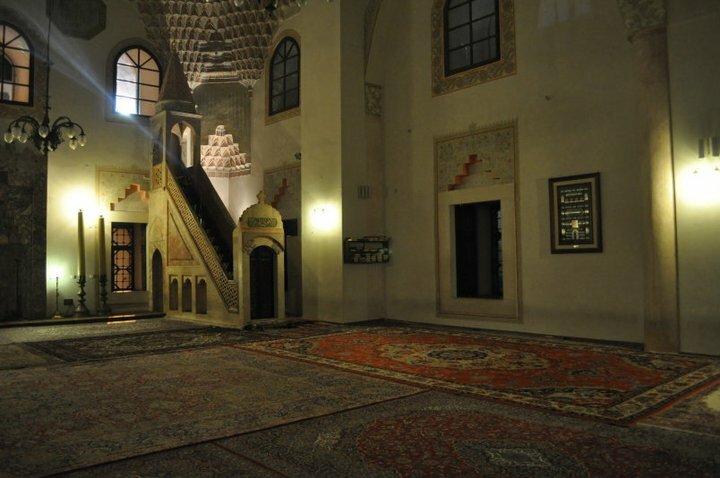 The Tekije (or Tekke) was built in the 16th century, and also houses something rather unusual for Muslim holy places, which is a Türbe, a tomb or shrine, of two of the sheikhs who had lived here. We then moved to the Žitomislić monastery with its Church of the Annunciation, a community of Serbian Orthodox monks, which had been originally established in the late 16th century. 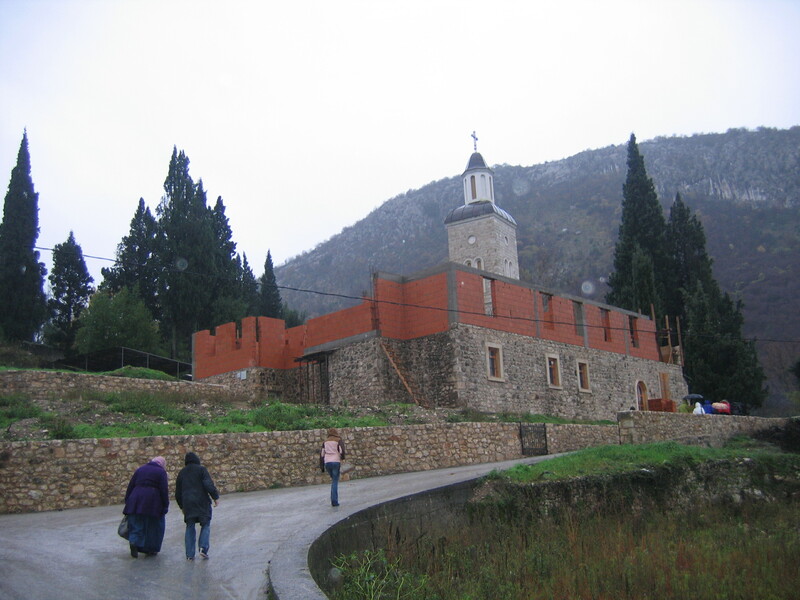 It is a site of martyrdom, as well: the monks here were all killed during World War II by Axis-allied Ustaše (Croatian Revolutionary Movement) and the buildings razed. It was rebuilt after the war only to be destroyed again in 1992 during the Bosnian wars and the collapse of Yugoslavia. The most recent reconstruction began in 2002. 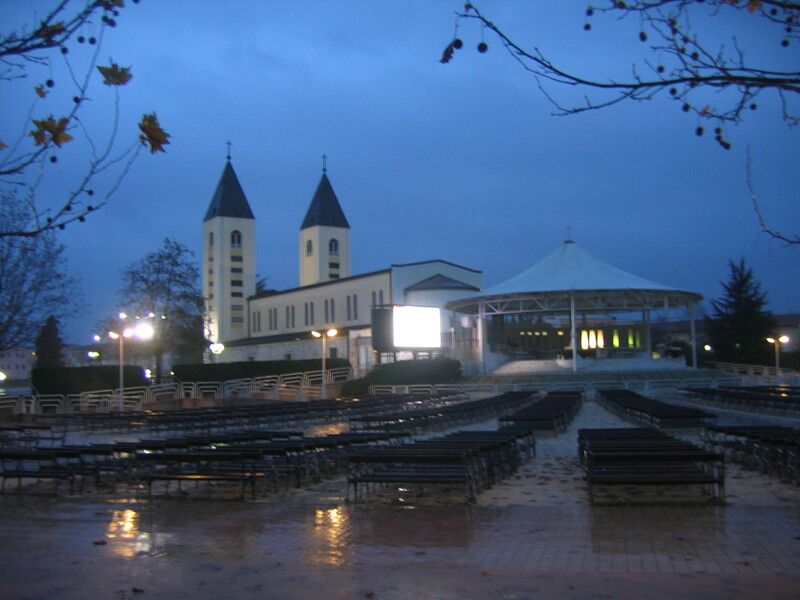 Međugorje was our next site. It had been pouring rain all day, and it was already dark by the time we arrived. Until the day before, I had not realized we would be coming, so I had not brushed up on the apparitions there, yet as the only Catholic theologian in the group, I was the default expert. Several people had not heard of the site, and were not familiar with the Catholic tradition of Marian apparitions, though some did know of either Lourdes or Fatima. There were few pilgrims in the church, and between the dark and the downpour we could not see or get up the hill. Since 1981, there have been claims of apparitions here, and the Holy See has not yet made a final decision regarding the site (and will not until the apparent apparitions abate), though the initial investigation by the local ordinary, concluded in 1986, was critical. The current status is that it remains open, and that no one is forbidden from going unless and until the message is determined to be false. At its best, the Church would never require anyone to believe in the messages, as general revelation ceased with the apostles, but would allow veneration. Finally, we ventured to Mostar, a 15th century city known for its Stari Most (“Old Bridge”), which stood from 1566-1993 when it was destroyed by Bosnian Croat forces during the war. A new Old Bridge has been reconstructed using the same technology and local materials as the original. It was inaugurated in 2004. Since 2005 it has been on the World Heritage List. 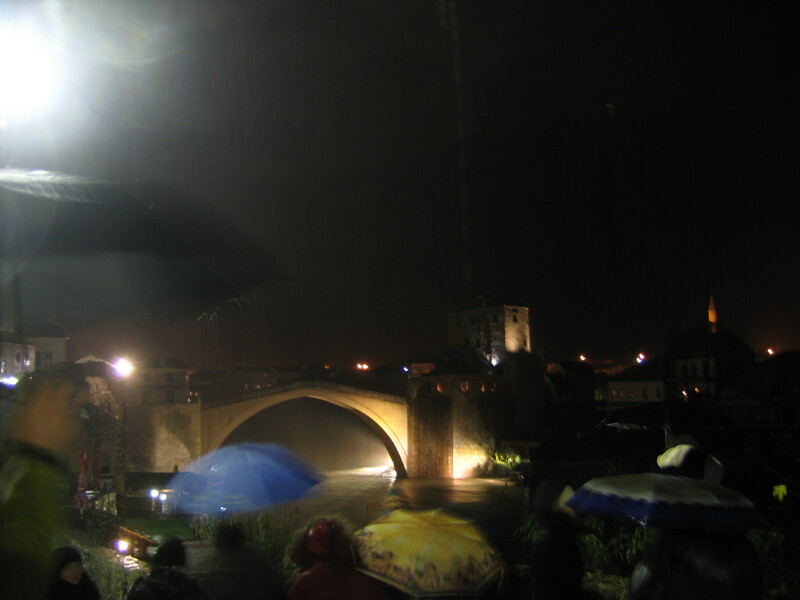 It was another great city that was unfortunate to visit in darkness and a downpour that would contribute to the flooding of the region in the days to follow. We had a pleasant local dinner and sampled Bosnian wine before heading back to Sarajevo. By A.J. Boyd in Bosnia and Herzegovina on December 5, 2010 .